Locating and selling short a security deemed not easy to borrow (ETB) used to require assistance from the TradeStation Trade Desk. TradeStation is pleased to introduce the Intraday Short Locate app, which enables customers to request locates of non-ETB securities without having to pick up the phone. Once locates are approved, customers with equities margin accounts can sell short non-ETB stock as they would ETB stock within the TradeStation platform, including in strategies running EasyLanguage®. With the Intraday Short Locate app, you simply identify which stocks you want to sell short and send locate requests for the maximum needed shares for each symbol either before market open or before the desired trade. This allows you to incorporate non-ETB short sales in automated trading strategies throughout the trading day. All short locate requests are valid for same-day trading, and new locate requests are required for each trading day. Any approved locate that is not used the same day expires at the end of the trading day. 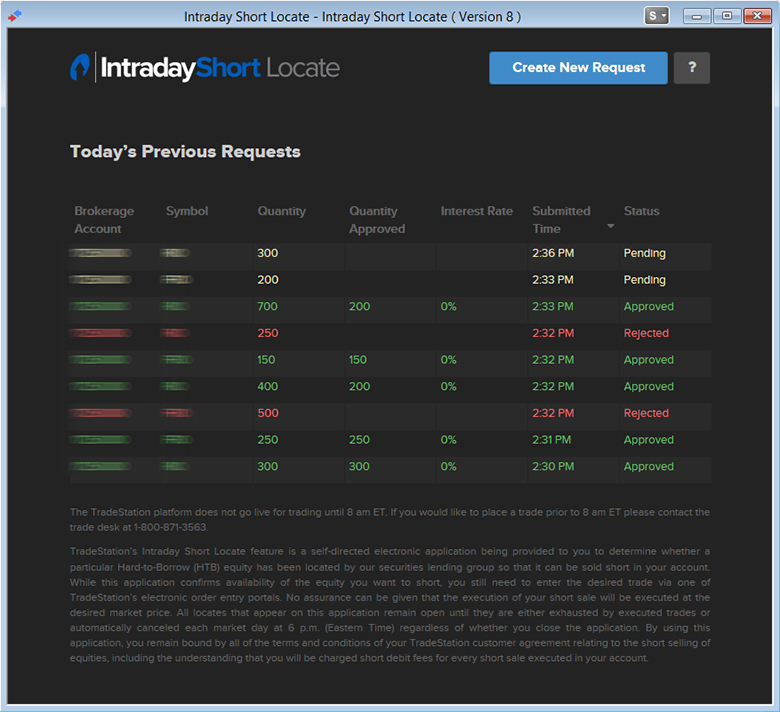 Intraday short locate requests are serviced from 7 a.m. to 5 p.m. ET, with trading commencing at 8 a.m. ET. 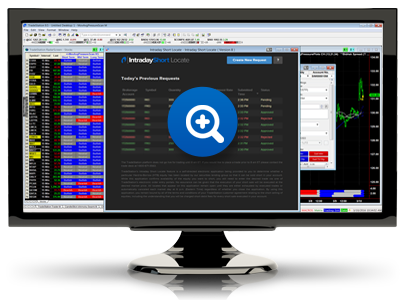 The Intraday Short Locate app will be automatically distributed to all clients who download the all-new TradeStation 9.5 Update 14, creating a seamless user experience. Although the app will work with previous versions of TradeStation, its functionality will be limited and manual download and login may be required to launch the app. The Intraday Short Locate app is available for use only in the TradeStation desktop platform at this time. TradeStation platform access is required to use the Intraday Short Locate TradingApp. Not yet a TradeStation client? Click here to open an account and get started. After you’ve downloaded and tried IntradayShort Locate TradingApp, remember to rate and review the app. TradeStation’s Intraday Short Locate feature is a self-directed electronic application being provided to you to determine whether a particular Hard-to-Borrow (HTB) equity has been located by our securities lending group so that it can be sold short in your account. While this application confirms availability of the equity you want to short, you still need to enter the desired trade via one of TradeStation’s electronic order entry portals. No assurance can be given that the execution of your short sale will be executed at the desired market price. All locates that appear on this application remain open until they are either exhausted by executed trades or automatically canceled each market day at 6 p.m. (Eastern Time) regardless of whether you close the application. By using this application, you remain bound by all of the terms and conditions of your TradeStation customer agreement relating to the short selling of equities, including the understanding that you will be charged short debit fees for every short sale executed in your account.